Bury Market shoppers snapped up a bargain when Key103 breakfast show present Mike Toolan came to raise funds for the station's Cash For Kids 1,000 Faces campaign. As Mike has just moved house he thought it would be a good idea to sell off some of the possessions he no longer has room for. 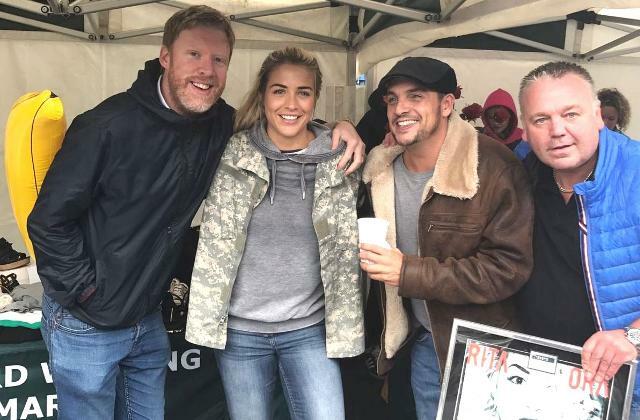 Armed with loads of merchandise, he and his co-hosts Matt Haslam and Gemma Atkinson came to Bury Market yesterday on a rainy Wednesday morning and converted the goods into money for Cash For Kids, raising a total of £235.72. Market trader Peter Whipp, of Whippy's Pies, certainly got into the spirit of it. Not only did he buy a limited edition record from Mike, he rewarded shoppers who bought items with a voucher for a free pie from his stall. Markets manager Andrew Heyes said: "It was great to welcome Key103 back to Bury Market, and as usual lots of people took the chance to snap up a bargain. And we even had a bit of sun by lunchtime!" Picture: Market trader Peter Whipp (right) with the Key103 presenters Matt Haslam, Gemma Atkinson and Mike Toolan.